I recently took the CPC exam and passed it on the first try with an 86%. I had ordered the practice exams, and consistently scored in the 70s, so I knew I had a chance. The one thing that helped me more than anything else was crossing out answers that I knew were incorrect. This tip was listed in the Coding Edge publication, and it really does work! I focused on the correct ICD-9 code first, which eliminated 2-3 choices for each question which made selecting the correct answer much easier, as I did not have to look up every possible CPT code. I also whole-heartedly agree with other posters who have stated to answer the easier questions first. Doing that will give you a confidence boost which will make the rest of the test seem easier. Also, pace yourself! If you cannot answer a question within a minute or two, skip it and come back to it later if there is time. To the lady who failed the test 2x's already. I can understand about you taking the cpc exam and passing it. And that you was trying to pass it to increase your income for your family. I'm trying to do the same thing for my family. I just took my exam on 12-15-2012 for the 1st time. I hope I passed, but if I didn't I'm going to do just like u retake it until I pass. Because I will be a life changer for me to. I what to work from home part time for an extra income. Hi I just took my cpc exam yesterday and i finished with time left but I don't have any feeling that I passed or failed.After I left the exam I couldn't remember one question but I also did a lot of studying on medical term anatomy and Insurance,and basically just had a couple of questions on that.I found my test was all surgical and diagnosis so I was just wondering If anyone had the same experience.Thanks in advance. Curtis, There is a breakdown of the types of questions in a blog and video on the CodingCertification,org website. 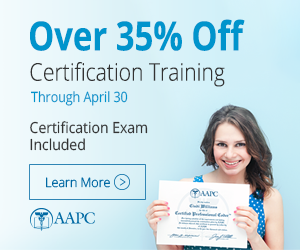 Enter "whats on CPC exam" and it will point you to it. There is a wealth of information on this site to help you prepare. I hope you passed, but if not, this same website has a treasure trove of information on how to prepare. BTW, insurance is not own of the topics on the exam. Many people are talking about highlighting and notes in your books for the test....can you or anyone whose taken the test offer advise on what this really looks like. What notes will be helpful to have in your book and what should be highlighted. I ask because in my program we were told we could not write in our books at all or they wouldn't let us e use them for the test. Now 10 months later at the end of my program and 10 days before my test I have no notes! UGH!!!!!!! If you are taking the CPC exam you CAN write notes in your books. You just can't have extra papers inserted or sticky notes. You can tab, highlight and write notes to your hearts content! Also, You should look up Codingcertification.org videos on youtube and watch how to "bubble and highlight". It will help you so much!! Start now since you only have 10 days until the exam. Also, in a different highlighter color, highlight the parenthetical notes under the code descriptions. That helped me tremendously! I would definitely write down the path of blood flow through the heart. That could be very beneficial to you. i know how you feel. I've actually just failed my 3rd attempt at the test. It is a major let down. I'm signing up for a 4th try in a month. I guess the one positive I can take is I have done better on each test and I'm only 4% points away from passing so at my current pace I should pass this one. I just took the CPC exam for my first time on 6-8 and passed. And the things that helped me, were my notes in the books..( muscle names/ parts of the stomach/med. term). But also, I crossed out the wrong answers immediately in the exam booklet itself. the proctor told us we can write in it..and i did..I crossed out, elminated based on modifiers when I could..and I still left thinking I failed. But thankfully I didnt. arichardson: you'll do great. I'm sure you've reviewed what went wrong, etc....THIS time is your time!!! I don't know if you're a praying person...but I am and will send some up for you! You got this! I'm reading through these posts to get pointers, as I am taking my first shot at the exam in a month. Today is the last day of an online course I have taken for 8 weeks. 8 weeks of 8-9 hours, five [sometimes 6] days a week, no teachers...just this course syllabus and my books...AND I AM FREAKING OUT (did I learn correctly? did I focus on the right things?). But I took my "final" exam for the course and the "mock cert exam" and scored an 83% and an 80%. It took me almost 8 hours to do the 150 question final last friday, and then I timed myself the 5hr 40min on the mock certification exam yesterday and the timer went off while I was on my last question. I was looking for additional pointers in timing and saw some great ideas here, so THANK YOU! In case it could help someone else, here is what I did to improve my time from that first test to the second by going through and answering all of the 'word' questions first...then answered all the ones that had only one code in the answers and then through to the answers with 2 codes....saving the biggest answers for last. I noticed that once I got the the answers that had 5-7 codes, all the CPTs were different...so process of elimination was easy. Good luck to you all. I wish I didn't have to wait so long before taking the exam, but it was the first available in my area. Thanks for the pointers on readying myself!